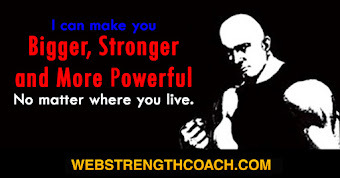 As an expert on matters relating to weightlifting, to which I have devoted a considerable number of years of hard study, I expect my readers to look to me more for instruction as to raising weights and training with weights for weightlifting, than for particulars as to light training with primarily in view the betterment of health of the development of muscle. 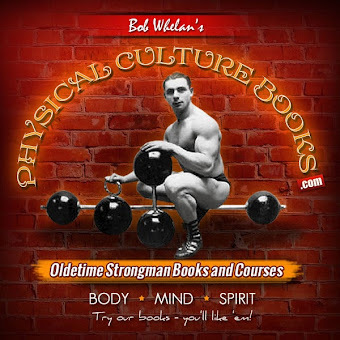 I think there are already a sufficient number of professors of Physical Culture who have given a sufficiency of information on this point, without my attempting to add to the already numerous systems of Home Training, but no doubt many will be interested to hear my views on the subject of light exercises in relation to weightlifting. In the first place I would say that if you must use dumb-bells for daily training, use heavy ones with fewer repetitions rather than light bells with numerous repetitions. If you use a chest expander use a goodly number of strands and few movements, as above. There are quite a number of chest expanders and wall-exercisers on the market, but my experience is that work with rubber exercisers does not develop the right kind of muscles for weightlifting. 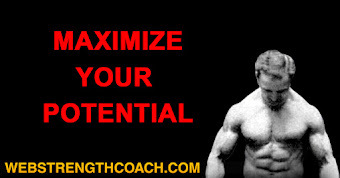 A chest expander should be better for weightlifting than a wall-exerciser, but it seems reasonable to expect that if your main idea is eventually to succeed in weightlifting, that as you have to lift iron weights it will be better to practise with iron weights, and the heavier the weights the better. 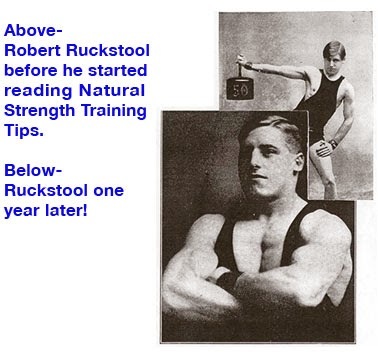 Further, a man of 10 stone who has practised weightlifting and is in good hard condition, would perhaps find it beneficial to use about 15 or 17 lbs. in either hand, at least, and to do a series of useful exercises similar to the positions practised in heavy weightlifting properr, say six or seven times each hand. This might be done with advantage perhaps twice per day, except when practising with weights, on which days no other exercises need be taken. 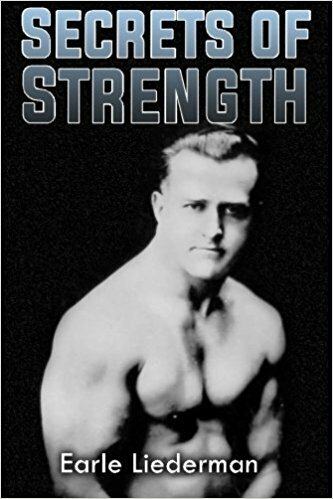 From the above it will be gathered that, in my opinion, when a man has got a good development and takes to weightlifting, he will be wise to drop all his light exercises, and reserve the energy and nervous power such exercises would eat up, for weightlifting. To such as have in view the improvement of health of development of muscle only, I have nothing to say, as any system of light training will improve such, and for health no doubt light dumb-bell work and any rubber appliance is good, especially for the business man to whom weightlifting probably would not appeal, and who would find it dangerous perhaps to start on a course of weightlifting without previous training. 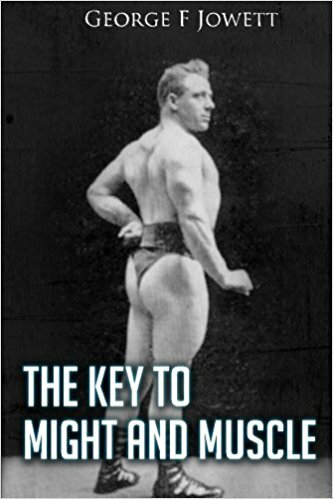 Therefore, I admit that in the case of a man who has the least suspicion of internal weakness or a weak constitution, it is absolutely essential that a preliminary course of light exercise be gone through with the object of strengthening the body and preparing all round for the harder work involved in weightlifting. Also, if a man has attained say the age of 35, and wishes to practise with weights, if out of condition, he, too, would be safe-guarded by first practising light dumb-bell work, or even, perhaps, some of the many free movements which are so largely advocated to-day. 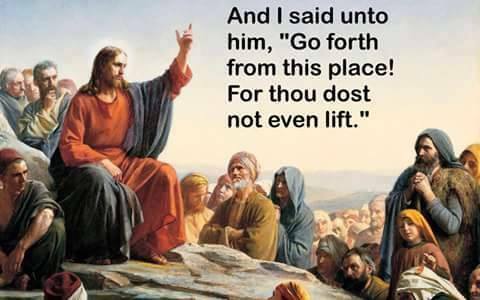 But at the same time I would say that the man who knows himself to be already constitutionally sound and internally perfect, with good physical development, should not waste time in light exercises of any description, but go right on to weightlifting, of course, practising at first with such weights as could be lifted with ease and comfort. 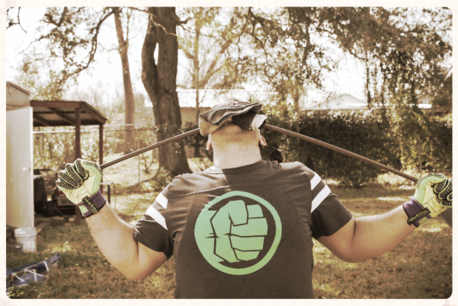 Club swinging is a form of light exercise which is of no use to the would-be strong man, as it stretches and makes supple the muscles rather than develops them with increased contractile power. Some will say that light exercises are essential if you would retain and improve your speed and quickness, and that weightlifting makes a man slow. I would say in reply that the man who wishes to be a champion weightlifter is not likely to wish to be also a champion runner, tennis player or boxer, any more than the boxer, tennis player, or runner has any desire to be a weightlifter. 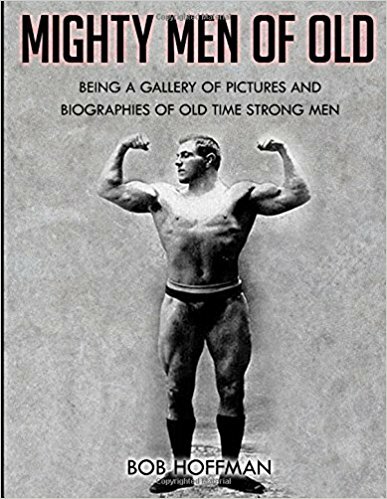 Beyond this I affirm that weightlifting does not have the deleterious effect on the muscles that certain well-known writer claims. No one has put in more practise with weights than I have, yet I am not considered slow. I am not a boxer, but I am a wrestler, and I believe in a wrestling match with the gentleman in question, I could quickly convince him of the above fact. However this may be, I will say that weightlifting may be practised with benefit not only to the physique and to the health, but that it is an interesting sport which has been the subject of many attacks in the public press from so-called authorities on hygiene and health, which have been quite unwarranted, and to which I am pleased to say the sport of weightlifting has not succumbed.